Okay, I'm finally going to ask about AR Games and Face Raiders, two sets of pre-installed software. If I recall correctly, these two began because of an argument that, since the Wii console had had an application called Wii Play11, the Nintendo 3DS system should have a something similar like “Nintendo 3DS Play.” 11 Wii Play: Software released for the Wii console in December of 2006. It held nine different games that utilised the functions of the Wii Remote controller. It seems to me as if it began with the question of whether we could make good use of the stereoscopic LCD screen in something. In reality, you'd made several games that used 3D, and you had several other slightly different things as prototypes, but that's where it started: you chose two likely looking prototypes and decided to polish them up. Is that how it was? Let's see… Yes, I think so. The ones that used AR12 were particularly well-received. 12 AR: An abbreviation for Augmented Reality. A technique of overlaying virtual information on actual images. I think it started with the idea that we'd have Kawamoto-san and his group create AR that used cards, and we'd create AR that didn't use cards. Oh, I see. That's why Kawamoto-san's team made AR Games, which use AR Cards, and Suzuki-san's team made Face Raiders, which doesn't use the cards. Yes, they certainly did turn into completely different games. (laughs) Let's start with the AR Games that Kawamoto-san and company created. There are lots of technical AR demos out there, but, surprisingly, what you've done in AR Games strikes me as being quite unique. You're right. I think you could see AR technology regularly on the Internet as far back as three or four years ago, but the first thing we saw was in the library, something they'd made in-house. If I recall, it had been made at the Entertainment Analysis & Development Division (EAD). That would be the demo that was based on the independent research by the Design Technology Group of the EAD, wouldn't it? Yes. That demo was of the AR that operated on the Nintendo DSi system. However, we thought that just having something appear on top of a card wasn't enough, and we treated it as one technology among many. Personally, though, I thought it had more potential than that. You wanted to get that technology out in public somehow. Yes. At the time, much of the AR you could see on the Internet was produced by stabilised cameras connected to desktop PCs. Then, graphically, not much changed, so it came off as a bit lacking. With a handheld game system, though, you can move the camera, so the image can change in many directions. I thought that would be interesting, so we started experimenting. Which resulted in games where a 3D dragon jumps out of a box and you shoot at targets, and where your own Mii character appears on top of an AR Card. Originally, the plan was to include only one AR Card with a question mark, however, ultimately, we ended up including six! Could you tell us how that came about? Of course. It's a little like what happened in the story about how Mii characters came to be made automatically with the camera. When we first made an AR Card with a question mark on it, we took them around to various people and asked, "Is it okay if we make something like this?" Then Miyamoto-san said, "This is a Mario card, right? Doesn't Mario come out of it?" Yes, muttering again. (laughs) We were already pretty far along in production at that point, and when I heard that, I thought, "Oh, this is bad…"
When you'd only been planning to include one AR Card, of course you'd think that: "We have to make more AR Cards starting now? That’ll be a tough challenge!" Since we'd have more types of AR Cards, there were lots of issues we had to overcome, such as what to do to avoid misidentification. It felt as though our workload had suddenly increased six-fold; we went around to different teams, asking them, "Give us a model of Mario" or "Give us a model of Samus." As we made them, I thought, "This sort of like a mini 'Super Smash Bros.'"
But when we actually made them… AR Cards with characters are fun just by themselves, and then of course Mario and other characters come popping out of them. I'm glad we put them in. That is really surprising, isn't it? It really does feel as though there's a figure right there in front of you. When you turn the AR Card, it faces different directions, and you can make it face different ways by using the Circle Pad, too. You can also change its size and make it move. You can put several characters out at once, so I think there are lots of different ways people can play with this. We hope players will walk around outside with it and surprise their friends, instead of just playing with it at home. Since that's what we want, we made AR Cards about the size of credit cards, so that people can carry them around easily. Although there were some people who said, "It's Nintendo, after all. The company that began as a playing card manufacturer. Shouldn't you make them the size of playing cards?" At that size, though, it would have been hard to put them in a wallet. So we made them credit card-sized, slightly smaller than playing cards. AR Cards are easier to read if they're larger, so I worried about this and that, but we ultimately prioritised portability. That said, conversely, you also made a prototype of an AR Card that would have been too big to carry around. 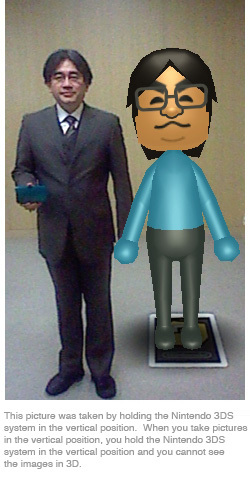 The one they showed me was a big AR Card, with a life-size Mii character on top of it. The moment I saw that, I said, "Let's make that a Club Nintendo13 reward," right then and there. 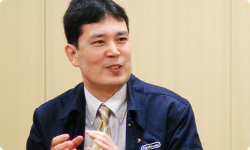 (laughs) 13 Club Nintendo: A free, members-only service run by Nintendo, begun in Japan in 2003. When members purchase applicable game software or game systems and register the product code on the Internet, or respond to post-game surveys, they earn Stars and can exchange a corresponding number of Stars for special, not-for-sale items. I'm very happy about that. With AR Games, all you have to do to make larger things show up is make the AR Card larger. You're not sleeping beside it, though. I want lots of people to be surprised, so I'd love to make this a Club Nintendo reward. This time, we've prepared a large AR Card, which you can use to take a photo with your life-size Mii character, as a Club Nintendo reward. Detailed information, such as how many points you'll need to get it, will be published on the Club Nintendo website in a little while, so keep an eye out for it. Editor’s note: European Club Nintendo members should keep an eye on the Stars Catalogue for future updates.